There is a better way of figuring out pattern-identifier code than that presented in the TI manual. The TI screen is divided up into a giant grid of 24 rows and 32 columns for graphics. 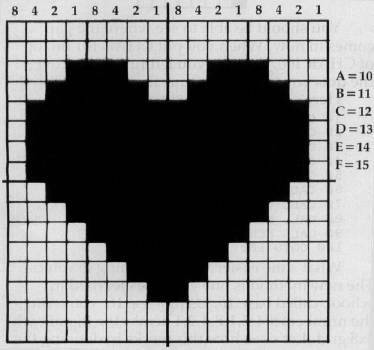 This grid, shown in your TI manual in the CALL CHAR section, makes 768 positions or spaces for you to put your graphics in. Each square of the grid is divided up into an 8×8 grid consisting of 64 dots to be turned on or off. Each 8×8 grid is divided up into a "left block" and a "right block." Each time you define a pattern-identifier, you use all 64 dots whether or not you so stipulate. Thus, the statement CALL CHAR(100,"FF") covers all 64 dots even though you stipulated only the top row of eight dots to be turned off; the remaining dots stay turned on. This can be seen by a simple little exercise. Make a box outline, 4×4. No matter what you do, this won't work; there will always be a gap somewhere. Remember that even though you didn't stipulate all 64 dots in CHAR 100, you still have them to deal with. You should be able to see where the gap comes in now. When you put CHAR 101 on top of CHAR 100, the dots you left turned on cover the dots you turned off, thus the gap. What's the easier way of defining graphics? The new method is one your kids learned in school, called base 16. 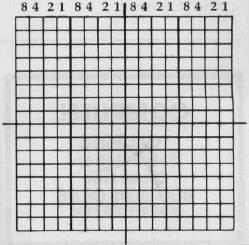 Using base 16, you write the numbers 8,4,2,1,8,4,2,1 across the top of each 8×8 grid. Let's see how this works in defining the heart; we will make it two positions high and two wide. Using base 16 is easier.